Occasionally you might need to join smaller pieces of photos into one whole for some reasons. You can use photo editing tools such as Coreldraw, Photoshop, etc to do the job. However, with these photo editing programs, you need to manually align, adjust and merge the images together. ImageConct is a simple application for you to merge and join your images into one big piece with just a few clicks if you want to get things done fast. ImageConct was designed originally with the intention to help people to create sprites for DS games. However, users can try this program to quick merge images into one if they want to. Users can add the images which they want to join together, select layout either vertical or horizontal orientations, and set the default background color for empty spaces. Once it is done, just click on to “Do Concatenation” to generate the merged images. Even though this program can quick merge images, it doesn’t allow users to reposition the images and preview the outcome before merging them. 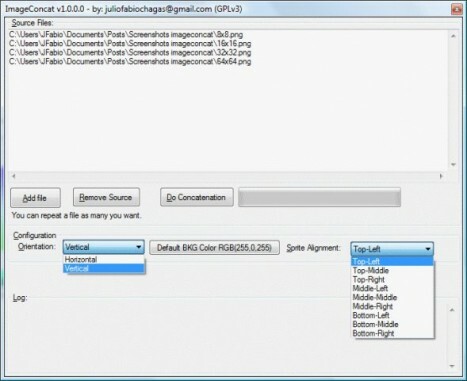 Download Image Concat via the link here.